Last night while waiting at the movie theater for friends to arrive so we could go watch Thor, I passed the time by checking Twitter and Facebook. While scrolling through my Facebook feed, I came across this little gem. Apparently, someone from my high school is helping a family to track down a kidney for their sick child--an admirable endeavor. Please note the donor characteristics listed in the posting. Now imagine me, leaning against the wall at the theater, saddened by the closure of the bar next door, and wishing I had a ticket so I could get a glass of wine at the bar upstairs. Now imagine me amusing myself by scrutinizing Facebook and making random comments. 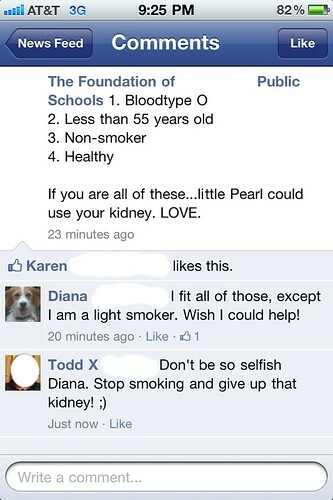 Finding Diana's comment was like striking oil in a gold mine. I have no animus toward Diana. In fact, I don't even know her. But, I know this type of comment: "Oh, I am soooo interested in this and need to write something so people can see how interested I am. Now, I won't actually be doing anything in response to this posting or my comment, but I hope people will notice me and maybe comment about it. And don't forget to "like" my comment!!" This, my friends, is self-serving social media. We're all narcissists on Facebook. That's kind of the point. But, co-opting others' narcissism to feed your own while pretending you're not doing it? I call shenanigans. I do hope, though, if you see this on Facebook, you will share and "like" it. They like me. They really, really like me! !